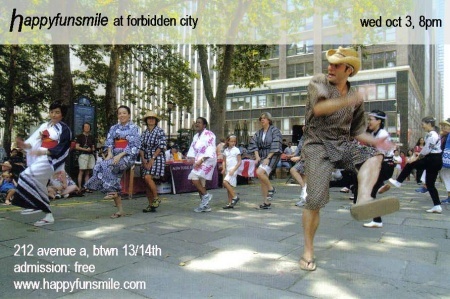 HAPPYFUNSMILE will be performing at Forbidden City on Wednesday! Have you seen Kossan, our sanshin-playing Zen monk? Have you heard Rodrigo, our Japanese Brazilian enka-singing star? Have you experienced the duo of Rob and Ali, on bari and alto saxes? Now is the time! You are currently browsing the wynn yamami blog archives for September, 2007.